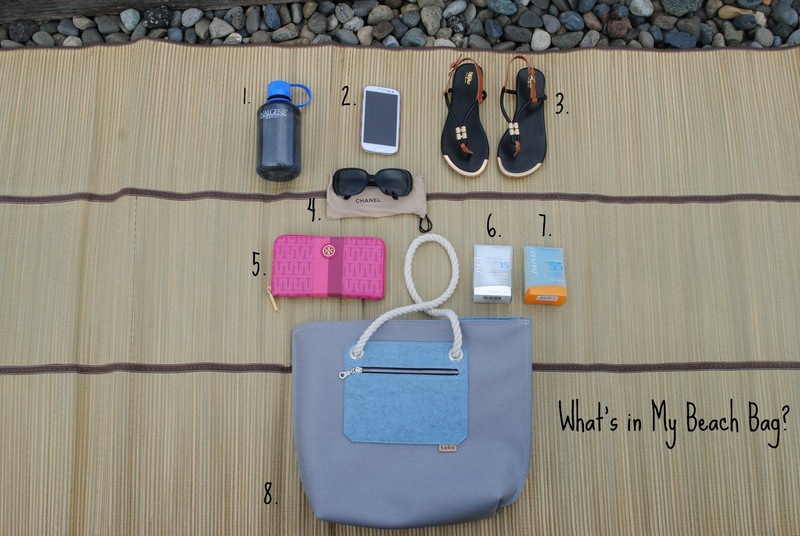 She is Lovely: What's in My Beach Bag? ohh i really love your beach bag! it's sooo nice!! Happy 100th post! This outfit is adorable. I love the stripes with the denim jacket. And I'm really loving your tote bag too! I've been thinking about picking up a pair of those sandals from Target! They're really cute. Love your dress too! I love the colors you picked out, Sheila! Super cute bag that will be so versatile for summer! gorgeous view. i love your sandals!! you also have a super cute blog! Loving your dress! Nice colors for your bag. I usually take my cell, towel, sunscreen, book, shades, snacks, and water. Curious tag, and the bag for the beach is great! really like all your items! Cool photos, I love your background! What a great outfit for a day out. Love that beach bag too! Ooh I love your nautical look here. So cute! Thanks for coming by look.feel.be today! Love this look and the striped dress! Hi Sheila. Thanks for stopping by my blog. As soon as I saw your blog name I knew who you were because I have seen your blog several times & started reading from the beginning - your earliest posts. I will make sure to get all the way to today. So I am a fan of your Style & Your Blog. And I am following you, hope you follow me back. I was just about to buy those shoes. They are in so many fun colors. I love your dress and sandals! You look great and gorgeous pics and skyline. Hi Sheila, Congrats on your 100th post! I really like your dress. It's so cute. I love reading "what's in my bag" posts. They're so fun! OMG its a perfect bag! Cute bag! Love the dress too! Cute beach bag and sandals! Love your striped dress too. Loving the bag and what an AMAZING background for pictures!! Tory Burch wallet, what??? I'm jealous! That bag is just fabulous! And I love those sandals. I got the brown version and cannot wait till warms up so I can wear them. Love the whole look and the backdrop! What a cute bag and enough room to haul even the kitchen sink, lol. Your outfit is so cute and perfect for the day. That bag!! Oh I love that bag. Love this, i love that dress and then i loved the idea of doing whats in my bag along with the outfit post! Very clever! Don't you just love Alki beach? I wish I could go there every day. Such a fun view of the city that I hardly get to see. I agree!! :) I love going there when it's nice and sunny. haha.. I wish I could go to the beach,somewhere very hot right now.Lol! That is a nice tote you have. Very nice pics and your bag. That bag is amazing...really love it! I have to have that dress! Thanks for sharing! Its so pretty =) Also love the bag! CUTE outfit! I love that bag, it is the perfect size! Wow cute outfit! I love your top so much! & i love your blog even more!! I will follow you here & on bloglovin. Would be nice to get some followers too. I'm following you back now darling!!!! ahh this is such a cute outfit babe! i love it such a cute seaside weekend trip to the cape cod look hehe! i love that bag.. so lucky you got to customize that bag it's sooo cute! i love it! That does look like the perfect beach bag and I love the colors you chose. I love your casual beach outfit as well. I don't enjoy walking on rocks (does a number on my feet) so hopefully it wasn't too uncomfortable walking on them in your sandals. Lovely photos. I love that it looks so dreary out, and your outfit is such a pop of colour! Thanks for your comment Sheila :) I see you're based in Seattle! Very close to me! I'm based in Vancouver! OH wow the size of your beach bag is perfect to fit all the stuff I always carry, I want it. Cute outfit, thanks for the comment on my blog, I'm your new follower!!!! Follow my blog! I love this post - mine has at least twice as much though! great look! love that bag, and those sandals! I love "what's in the bag" posts! So glad I got to see inside yours...and what a cute dress on you! 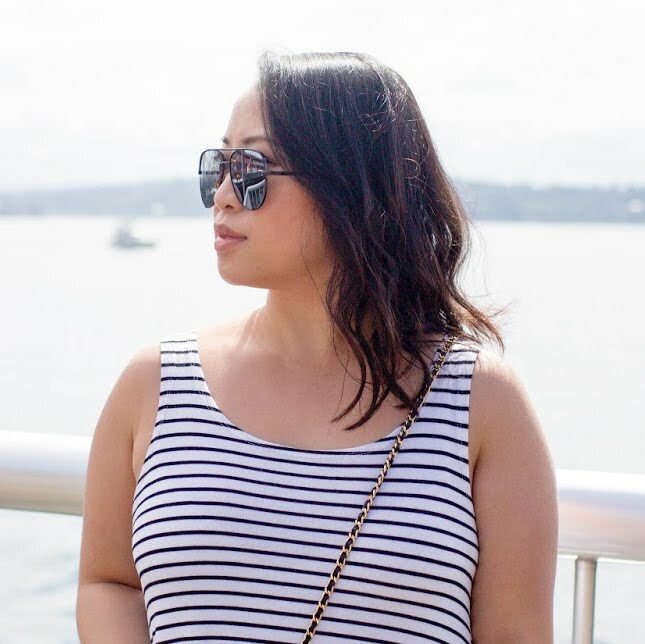 This is such a cute nautical look,I LOVE the stripe dress and the bag is so cute. Ooo I always carry around a water bottle too. great nautical outfit! such perfection. love those sandals!